This summer, say YES to the sun but NO to damaged hair! Our organic hair mist will be your best hair ally for this summer. 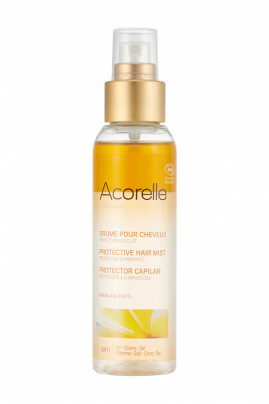 This protective mist will protect your hair from external aggressions. Its complex of organic vegetable oils and ultra natural ingredients form a real mechanical film, among other things, anti UV, anti salt and anti chlorine, for perfectly healthy, silky and protected hair. In order to provide the best protection to your hair against UV rays, pollution, and salty and/or chlorinated water, we have mainly formulated our organic hair mist with organic karanja oil, organic buriti oil and artichoke extract. Known for its fabulous nourishing and protective virtues, organic karanja oil gives your hair shine, restores all its shine, and above all protects it from UV rays to keep it nourished and shiny. Organic buriti oil also has incredible properties. It prevents your hair from dehydration, helps protect your color and therefore prolong the shine of your hair, even at the beach. To this complex of vegetable oils, we have combined an artichoke extract for its fabulous antioxidant properties. Its repairing and protective action prevents damage caused by free radicals and protects the hair from this oxidation. The artichoke extract thus avoids the degradation of the hair fiber for a reinforced hair protection. Our organic hair mist also contains an amino acid derivative, derived from corn and rice, to preserve the beauty of the hair fiber. As this active ingredient is very light, it can penetrate the hair quickly, without weighing it down. It improves your hair's resistance, softness and shine. Even exposed to the sun, your hair will be soft and will keep its volume, all without drying out. The color will be protected, to remain intense, uniform and bright throughout the summer and throughout the year. Shake it, it smells like summer! The Organic Hair Mist Spray leaves a light veil on your hair, so it doesn't weigh it down. This organic hair mist that will accompany you all summer (and even the rest of the year!) is subtly scented, with notes of jasmine, orange blossom and vanilla. Its fragrance is 100% natural and non-photosensitizing for safe exposure to the sun.